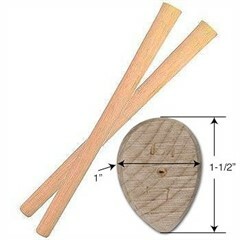 Extra Handle for Mini-Blackhawk Tomahawk - Southeastern Outdoor Supplies, Inc. Replacement handle for Mini-Blackhawk Tomahawk. This is the same handle as the full size version Blackhawk Tomahawk. This handle requires a small modification of cutting off approximately 1.5" from the end to give balance and proportion to the smaller head.